This fortnightly email is to keep you updated on the work of Women with Disabilities Victoria, and updated on news related to our priority areas. Contributions to this eNews are welcome, email wdv@wdv.org.au. The Genetic Support Network of Victoria is hosting Peer Support Training on Saturday 14th of November. Welcome to our e news which has a host of information on different issues of concern to women with disabilities. The NDIS has released its Housing Funding Principles which focus on specialist disability housing. In September, the Council to Homeless Persons hosted an excellent and lively Conference and I was pleased to have the opportunity to highlight the housing issues our members face. Women with disabilities who have physical access requirements and/or lower incomes have appallingly limited housing options. Women with disabilities often live in supported accommodation such as group homes because there is no accessible, affordable private rental accommodation. For women experiencing violence - regardless of whether it is in supported accommodation or within a family environment - there is often no escape. Without a concerted effort by local, state and federal government to address our anachronistic housing code and building regulations we will never overcome the lack of access to affordable, accessible housing. An accessible path of travel from the street or parking area to and within the entry level of a dwelling. Doors, corridors and living spaces that allow ease of access for most people on the entry level. A bathroom, shower and toilet that can be used by most people, with reinforced wall areas for grab-rails at a later date. This is very achievable. Other countries have done it, let’s see the political will to do it here! An Office of the Public Advocate report just released finds that when a child is reported to Child Protection Services, a parent's intellectual disability or mental illness is categorised as a major risk for the child. Public Advocate, Colleen Pearce told The Age, "Rather than getting encouragement or support to parent their child, the parent comes under intense negative scrutiny." 'Jess' is a woman with a disability who shared her experience of Child Protection services with The Age, '"I was a bit shy, I didn't know my rights and I had a lack of understanding about supports I could ask for." The report finds considerable evidence that with information and support, people with disabilities generally successfully parent. 'Melissa' shared with Daily Life part of her pregnancy story. "I am not against tests for Down Syndrome or screening for other disabilities. I also support women's right to terminate their pregnancies if they choose. But I've recently discovered that my decision to choose not to test for disabilities is not afforded the same level of respect." 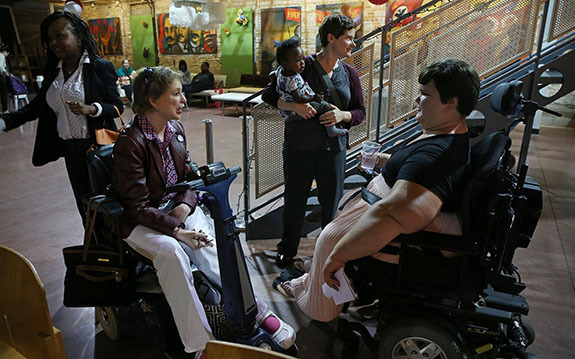 IMAGE of women with disabilities who developed the reproductive health rights guide from Disability Scoop. The NDIS will be rolled out on a local government area region by region ( watch video for details). This process is anticipated to continue over the next three years concluding in June 2019. NDIS have made a video to help explain when the scheme will reach different areas. For more information, see the Disability Advocacy Resource Unit's page, What's the Plan for the NDIS in Victoria? Minister for Housing, Disability & Ageing, Martin Foley opened the newest Changing Places facility. It was completed in time for the third term school holidays. Changing Places facilities are larger-than-standard accessible toilets and have extra features and more space to meet the needs of people with a disability. Each facility has a height-adjustable, adult-sized changing bench, a tracking hoist system, space for two people and a safer and cleaner environment. This story is via DARU Update. On the heels of the Quarterly Report on the National Disability Insurance Scheme rollout, the Government has released the six principles that will guide the $700 million NDIS housing capital budget, writes disability services consultant Luke Bo’sher in Pro Bono News - content via DARU Update. allow for the continuity of supply from providers and also ensure there is scope for change and innovation over time. If you want current best practice models and information regarding the prevention of violence against women then DON'T miss the Towards Gender Equality forum. The Barwon Centre Against Sexual Assault (Barwon CASA) has brought together leading experts to increase professional's capacity to make informed, evidencebased decisions regarding implementation of violence prevention programs. The forum is also a great networking opportunity to discuss relevant issues and meet other like-minded professionals. WDV are looking forward to attending the forum and presenting on the Gender and Disability Workforce Development Program. RSVPs required. El Gibbs reports on Women with Disabilities Australia research in Women's Agenda, “Working age women with disabilities who are in the labour force are half as likely to find full-time employment (20%) as men with disabilities (42%); twice as likely to be in part-time employment (24%) as men with disabilities (12%); and regardless of full-time or part-time status, are likely to be in lower paid jobs than men with disabilities.” This shows clearly that women with disabilities are missing out on the opportunities that employment can provide, adding to poverty levels. While professional counsellors are helpful, there is nothing more powerful than talking to someone who has been "in the same boat" as you. Peer Support Training is available for all individuals, including staff from support groups. It is a one day workshop and which aims to help you feel empowered to listen and talk to others who are in a similar position, and share your wisdom and experience. For more information, please see their website. RSVP by Tuesday 3rd November to info@gsnv.org.au. Applications are now open for the Victorian Government’s Self-Help Grants program for organisations that support people with a disability, their carers and families. Grants of up to $10,000 are available to strengthen the capacity of people with a disability to live independently, participate in community activities, and make informed decisions. Grants are also available for peer-support and information. Applications for the 2015-17 funding round close on Wednesday 21 October 2015. The 2016 Young Carer Bursary Programme will deliver 333 bursaries worth $3,000 each to assist young carers up to 25 years old. The aim of the bursary is to encourage young carers to continue studying by relieving the financial pressure to work a job in addition to their caring role. Maribyrnong Inclusive Recognition Awards awards are given each year to individuals, clubs, groups, businesses and not-for-profit organisations that have contributed to improving the quality of life of people with disability in the City of Maribyrnong. Nominations close 5pm Friday 30 October 2015. Singers and choirs are invited to join the "No Excuses! women's massed choir", presented by the School of Hard Knocks and the Big West Festival. No Excuses! is a new song suite, created by composers Christina Green and Kathleen McGuire, focusing on family violence. Performed by women singers and instrumentalists, it will premiere at the Big West Festival in November 2015. Register and sign up for 8 rehearsals and 2 performances. The Victorian Parliament’s Family and Community Development Committee is commencing stage 2 of its inquiry into abuse in disability services.This stage of the inquiry will focus on why abuse is not reported or acted upon and what can be done to prevent it. It will also look at how Victoria’s disability care system can be improved and strengthened in the transition to the National Disability Insurance Scheme (NDIS). “We want to know the extent of the problem. We also want to hear suggestions about what can be done to ensure people with disabilities do not suffer abuse,” said Committee Chair Maree Edwards. All submissions will be made public. However, confidentiality can be requested. The Committee will be conducting public hearings in Melbourne and regional areas. The closing date for submissions is Friday, 30 October 2015. The Committee is due to report by March 2016. An interim report was tabled on 6 August 2015. Text in this item was prepared by DARU. Anyone with something to say about disability access to Victoria's Multi Purpose Taxi Program and hire cars is encouraged to participate in this consultation. Visit the transport consultation website or call 1800 064 887 to have your say. Good Shepherd and the Australia Institute are doing research into economic security for survivors of family violence through a short survey. The confidential survey is for anyone who has experienced, or is currently experiencing any form of domestic violence. It asks about financial stress, access to income and assets, employment and superannuation. If you have any questions contact Tanya Corrie on 03 8412 7320 or Tanya.Corrie@goodshep.org.au. Brain Injury Matters facilitates self-advocacy and community education for people living with an Acquired Brain Injury. They invite you to their AGM. After the business has been completed, you are invited to make stars for the 1 Million Stars to End Violence which is a love and peace filled community project by artist Maryann Talia Pau. The aim is to bring people together around the world to weave 1 million stars for a display in Queensland Australia, 2018. These beautiful stars are symbols of light, courage and solidarity to end all forms of violence, including violence against women, bullying and racism. Please stay and have a light luncheon with us. Communication Rights Australia is an advocacy and information service for people with little or no speech. Their AGM will feature a panel discussion on the barriers an enablers to access to education for children with little or no speech. The panel members are Julie Phillips (Disability Advocate), Jai Phillips (Communication Rights Education Advocate and Rosie Crossley (Service Provider). CRA will also launch fact sheets on Access to Education. This meeting is an opportunity to for the Royal Women's Hospital to share their work and highlight the hospital's role in improving the health of women and babies. Members of the public are welcome to attend, but RSVPs are required. Light refreshments served after formal proceedings.